Joe started his speedway career with the Cleveland Bays in 2006. In 2007 he joined the Scunthorpe Scorpions in the Conference League winning the League Championship, the Knockout Cup and the Conference Trophy in his first full season. In November just after his 16th birthday he was signed by Wolves, he went out on loan to Workington in 2008 doubling up with Boston in the Conference League. In 2009 Wolves named him at number eight for the Elite League side doubling up with Premier League Rye House but an injury mid season in the Under-21 meeting halted his progress. He returned later in the season. 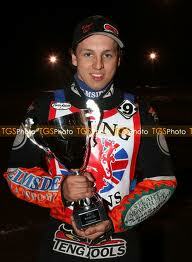 Again in 2010 he was Wolves number 8 doubling up with Kings Lynn in the Premier League this time, he won the British Under-21 title in April. Joe decided to winter in Australia at the end of the 2010 season but at Gilman in December he crashed and was fighting for his life when he broke his shoulder in six places, broke seven bones in his back, broke seven ribs and suffered a punctured lung. In April 2011 Newport signed Joe but after just two appearances he was left out, he returned to Scunthorpe but he struggled to find his form he moved to Somerset and Newcastle before joining Sheffield. He stayed with Sheffield in 2013 but announced his retirement from the sport in August.